If you’ve set up an Office 365 Service Communications API OAuth for your organization, you can now choose to have messages sent directly to your inbox. Enable email notifications from your organization settings page and you can choose what type of notifications you’d like to receive and which addresses you want them sent to. The heatmap widget is probably our most popular dashboard widget, and we’ve been making it even better. We’ve improved the way it lists sites to make it easier for you to see at a glance where a problem is and which sites are offline. We’ve also increased the available space, so you can create longer, more specific site names. Alarms can be integrated with any system via Web Hooks now. Read more about it. Office 365 Service Health Incidents and Messages for each customer’s tenant can now be subscribed to and published via email with CloudReady. You no longer need to sign into the Office 365 Portal to see Office 365 Service Health. Read more about it. Private Sites now support longer display names, up to 255 characters and the Heatmap was updated to show more of the display name characters as well as the site machine name. The Metric Scorecard widget was enhanced to enable clicking through to a sensor when the scorecard is configured for a single sensor (as opposed to an aggregate by sensor type). For many widgets, but most importantly the Metric Graph widget, we improved the ability to show Network Path Performance Data. This enables dashboard correlation of NPP data alongside other metrics. This fixes the inability to trend and show NPP data via widgets like Trend Grids. For the main sensor details page, across all of the sensors, we improved the display of historical Network Path Performance data going back on an hourly basis for up to 30 days. This can help see longer term trending of NPP trace data and enable better correlation with service performance. We added a new product to the CloudReady Suite! Reporting is the newest addition to our set of tools. CloudReady is all about providing a single pane of glass to monitor the services you rely on, and the new reporting features will let you view data and statistics about your SaaS services over time. We’ve rolled out a beta version already that utilizes the Microsoft Graph API with much more to come in the near future, so stay tuned! To try out reporting, add the Microsoft Usage OAuth to your account here, and then add a O365 Usage widget to your dashboard. 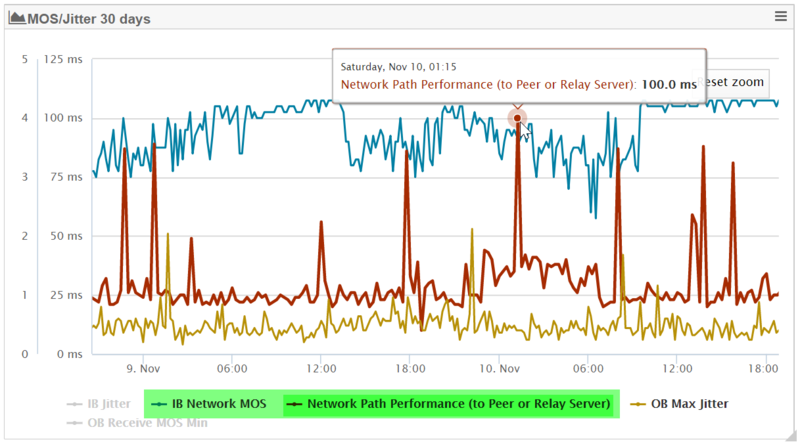 The Network Path Performance tab on the sensor details page has been upgraded. We’ve made minor changes to the data presentation to make diagnosing trace problems easier, including better segment analysis to let you know where in your trace you’re spending the most time. Exoprise Service Watch has gotten better! You can now match domains with wildcards, making sensor configuration easier and more intuitive. We’ve also made sending invites easier. Now you can allow a user to install the Service Watch extension on multiple browsers by sending multiple invites instead of creating multiple users. That can be handy when diagnosing or getting a baseline across multiple platforms. The Manage Sites page was updated to enable bulk management and improved filtering across sites. Read more about the manage sites page and its capabilities. New Help site is available. Welcome. The Edit Sensors received a much needed upgrade. Filtering by sensor types, site and other conditions was improved in addition to more flexible column configuration. An option was added to export configurations as a CSV file which should assist with sensor management, documentation and reconfiguration. We added support for RemoteApp in the CloudReady RDP sensor. This was a popular request as many customers and service providers are delivering legacy thick client applications through RDS on Azure and using RemoteApp to publish those applications to end-users and customers. Fully executing and testing the RemoteApp and Remote Desktop infrastructure ensures uptime and availability while enabling you to troubleshoot and diagnose problems that may occur. No more passwords for CloudReady, you control the access. Manage who can access CloudReady with your own Identity Provider. CloudReady supports multiple SAML configurations, per-tenant, for extra control and configuration. Use different configurations for testing out new identity providers, during migration, or for additional flexibility. SAML configurations can automatically provision users within a specific role or you can require an invite, first, before they are allowed to access CloudReady. Users that previously had CloudReady-based accounts are automatically converted when they sign-in via SAML. At this time, Organization (tenant) owners will maintain their previous credentials (passwords) in addition to SAML-based sign-in capability. This is for emergency access in case the SAML provider is unavailable or mis-configured. We recommend maintaining at least two Organization owners within a tenant. A column was added for ‘Free Space’ and it reports the available disk space for the computer running the site (OS Drive). We also added a column when an update is available for a site. You can see the changes here.Ensuring the machines running CloudReady sensors have enough disk space is important to the health of your installation. CloudReady doesn’t take up much space but updates from Microsoft do – especially for older machines! Private site updates are handled automatically by CloudReady but you can manually schedule an update if instructed to by support, for new product features or if you would like to upgrade on your own schedule. New operations were added for Sites enabling customers to Refresh, Restart or Reboot their private site. These operations can be accessed from each Sites edit page. Use with caution of course – or not at all. These operations were added to assist customers with maintaining their sites in good working condition and if support requests that you perform an operation. Support was added for updating and deleting private sites as well as managing maintenance mode status. You can get more information about the API here.